Flow cytometry experiments by Injury Severity Score (ISS) groups: 1, ISS of 8 or less; 2, ISS of 9 through 15; and 3, ISS of 16 or greater. CXCR-1 loss is similar in all groups. There is a significant decrease of CXCR-2 in group 3 compared with groups 1 (asterisk indicates P<.001) and 2 (dagger indicates P = .05). Boyden chamber chemotaxis by Injury Severity Score (ISS) groups: 1, ISS of 8 or less; 2, ISS of 9 through 15; and 3, ISS of 16 or greater. Chemotaxis decreased to all stimulants with increasing severity of injury, most notably to growth-related oncogene α (GRO-α); however, this was not statistically significant. IL-8 indicates interleukin 8; fMLP, N-formyl-methionyl-leucyl-phenylalanine. Calcium mobilization by Injury Severity Score (ISS) groups: 1, ISS of 8 or less; 2, ISS of 9 through 15; and 3, ISS of 16 or greater. In groups 2 and 3, there is an increasing loss of calcium mobilization to growth-related oncogene α (GRO-α), a CXCR-2–specific chemokine. IL-8 indicates interleukin 8; fMLP, N-formyl-methionyl-leucyl-phenylalanine. Background In response to traumatic injury or infection, human neutrophils are directed to the site of injury or infection by CXC chemokines that signal via 2 receptors, CXCR-1 and CXCR-2. In vitro studies have shown preferential loss of CXCR-2 expression and function after exposure to interleukin 8, N-formyl-methionyl-leucyl-phenylalanine (fMLP), C5a, and tumor necrosis factor α.
Hypothesis CXCR-2 expression and function are preferentially down-regulated in severely injured patients. Methods We studied 20 patients within 24 hours of admission to the hospital. Patients with head injuries were excluded. Injury Severity Scores (range, 1-50; mean, 35) were calculated for each patient. To determine expression of CXCR-1 and CXCR-2, flow cytometry was used. Intracellular calcium mobilization and neutrophil migration to 10 nmol of interleukin 8, growth-related oncogene α, and fMLP was measured to determine receptor function. Results Compared with CXCR-1, there is a greater loss of CXCR-2 receptor expression in the severely injured group (P = .01). Neutrophils from patients with Injury Severity Scores greater than 16 did not mobilize calcium in response to growth-related oncogene α. However, there was no loss of calcium mobilization to interleukin 8 or fMLP. Chemotaxis to various stimulants is decreased in all injury groups. Conclusions CXCR-2 expression and function are preferentially down-regulated in severely injured patients. Our data suggest that there are multiple mechanisms, in addition to receptor down-regulation, that play a role in the loss of migration and calcium flux in human neutrophils after injury. 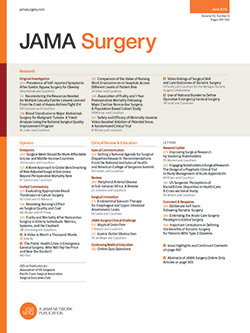 TRAUMA IS recognized as an inflammatory disease.1 Various mediators and indicators of an inflammatory response are elevated in severely injured patients.2,3 Many of these factors are significantly higher in patients who eventually died compared with survivors.1,4-6 Early or prolonged activation of the inflammatory response has been linked to the development of clinical syndromes, such as systemic inflammatory response syndrome, adult respiratory distress syndrome, and multiorgan system failure. Polymorphonuclear leukocytes are an essential to the acute inflammatory response. A causal role for polymorphonuclear leukocytes in the lung injury associated with trauma and sepsis is widely accepted.7-11 Their involvement in other forms of organ injury is supported by findings in animal models of disease.12-18 The acute inflammatory response is carefully regulated through the interaction between a range of soluble and gel-phase mediators and the multiple cell types present in the area of injury. One hypothesis to explain remote organ injury following trauma is dysregulation of neutrophil function. CXC chemokines are key mediators of neutrophil proinflammatory functions. Interleukin (IL) 8, the best studied, is produced in response to several inflammatory stimuli, including microbial products such as lipopolysaccharide and zymosan and the cytokines tumor necrosis factor α (TNF-α) and IL-1. It is secreted from monocytes, endothelial cells, fibroblasts, keratinocytes, and neutrophils. Interleukin 8 induces migration, activation, and sometimes proliferation of myeloid, lymphoid, and endothelial cells, melanocytes, and keratinocytes. In neutrophils, IL-8 induces calcium mobilization, priming of the respiratory burst, degranulation, and cytoskeleton reorganization in addition to cell migration. Interleukin 8 binds to 2 receptors on the cell surface, CXCR-1 and CXCR-2, which are G protein–coupled 7-transmembrane domain receptors. Both receptors bind IL-8 and granulocyte chemotactic protein 2, with high affinity. However, CXCR-2 is considered a promiscuous receptor because it also binds growth-related oncogene α (GRO-α), neutrophil-activating protein 2, and epithelial neutrophil activator 78. CXCR-1 and CXCR-2 ligation stimulates phosphoinositol hydrolysis, intracellular calcium mobilization, chemotaxis, and exocytosis, but only CXCR-1 stimulation results in activation of phospholipase D and the respiratory burst. The receptors also vary in the way their expression and function are regulated. In vitro studies19-21 have shown preferential loss of CXCR-2 receptor expression and function after exposure to various stimulants, including IL-8, GRO-α, N-formyl-methionyl-leucyl-phenylalanine (fMLP), C5a, and TNF-α. We have recently generated data supporting the notion that CXCR-2 is a regulatory receptor. This model proposes that CXCR-2 ligation primarily serves to modify neutrophil responses in a chemokine-specific manner. For example, CXCR-2–specific ligand GRO-α suppresses TNF-α adherence–dependent peroxide production, while neutrophil-activating protein 2 inhibits IL-8–stimulated chemotaxis. The expression and functional status of these receptors in trauma has not been previously studied, and provided an opportunity to test our in vitro findings in an in vivo human disease state. In this study, we show that patients who have undergone trauma have a severity-dependent and preferential loss of CXCR-2 expression and function. We speculate that this loss of CXCR-2 function might be permissive in the immigration and toxic functioning of neutrophils in traumatized persons. Patients who had undergone trauma were studied within 24 hours of admission to the hospital. This point after injury was chosen to allow for resuscitation, medical or surgical interventions, and stabilization of the patient before neutrophil isolation. All patients with head injuries were excluded due to possible association of disseminated intravascular coagulopathy, which may have deleterious effects on neutrophil function. Pregnant patients were not encountered during this study period. Patients who received multiple transfusions were also included in this study. A wide range of Injury Severity Score (ISS) criteria were used so we could elucidate if the severity of injury affected the loss of receptor expression and function. This study was reviewed and approved by the Institutional Review Board at the University of Cincinnati, Cincinnati, Ohio. After obtaining verbal informed consent from patients and healthy volunteers, venous blood was drawn in syringes containing 15% EDTA (Sigma-Aldrich Corp, St Louis, Mo). Erythrocytes were removed by dextran T-500 (Pharmacia, Piscataway, NJ) sedimentation. The leukocyte-rich supernatant was layered over Ficoll-hypaque (Histopaque 1077; Sigma-Aldrich Corp) and centrifuged at 400g for 30 minutes at 4°C. Pelleted neutrophils were resuspended in phosphate-buffered saline without calcium or magnesium (Gibco, Grand Island, NY), and residual erythrocytes were removed by hypotonic lysis. Neutrophil preparations were routinely greater than 95% pure, with greater than 95% viability by trypan blue exclusion. The cells were washed with phosphate-buffered saline containing 2% goat serum and then incubated with 1 µg of fluorescently labeled goat anti–mouse immunoglobulin (Kirkegaard and Perry Labs, Gaithersbury, Md) for 20 minutes at 4°C. After 2 final washes, cells were resuspended in 1% paraformaldehyde and analyzed on a flow cytometer (model Epics XL; Coulter, Miami, Fla). Flow cytometry readings were performed after standardization with beads (Standard-Brite; Coulter). The lower wells of the modified Boyden chamber were filled with various stimulants, including IL-8 (R&D, Minneapolis, Minn), fMLP (Calbiochem, San Diego, Calif), leukotriene B4 (Sigma-Aldrich Corp), and GRO-α (R&D). A 5-µm-pore nitrocellulose filter (Neuroprobe, Cabin John, Md) was placed over the stimulants, followed by a gasket and the upper half of the chamber. Freshly isolated neutrophils (1 × 105) were loaded into each well. The chamber was incubated at 37°C, with 5% carbon dioxide, for 30 minutes. The nitrocellulose filter was removed, fixed with 2.5% glutaraldehyde, and stained with hematoxylin. The filter was sequentially dried in 70% ethanol, 95% ethanol, and a combination of ethanol-butanol (80:20), and cleared using xylene. It was then mounted on a 50 × 75-mm slide. The distance migrated by the leading front of cells was determined using a light microscope with a calibrated knob. Polymorphonuclear leukocytes were incubated with a calcium chelator, 1 µmol/L (Fura-2/AM; Molecular Probes, Eugene, Ore), for 45 minutes at 37°C. The cells (2.5 × 106) were then washed and resuspended in Hanks balanced salt solution with calcium; magnesium; HEPES, 20 mmol/L; and 0.1% bovine serum albumin at pH 7.4. The baseline calcium concentration was 1.26 mmol/L. Fluorescence was measured on a spectrofluorometer (PTI, South Brunswick, NJ), with an excitation wavelength of 340 nm and an emission wavelength of 510 nm at 37°C, following stimulation with chemokines. In flow cytometry experiments, results were expressed as a percentage of mean channel fluorescence of patient cells vs normal cells. In chemotaxis experiments, the distance migrated by patient cells to buffer was subtracted from the distance migrated to IL-8, GRO-α, or fMLP. The percentage migration was calculated dividing the net distance migrated by patient cells by the net distance migrated by normal cells. Flow cytometry and chemotaxis results represent the mean ± SE values. Flow cytometry data were analyzed using the unpaired t test, and chemotaxis data were analyzed using analysis of variance (Prism; Graft Pad Software, San Diego, Calif). Study participants included 12 men and 8 women; the mean ± SD age of the participants was 35 ± 14 years (range, 18-51 years). The ISSs ranged from 1 to 50 (mean ± SD, 19 ± 15); 19 injuries sustained were blunt, while 1 was penetrating; and there were no deaths. The mean ± SD white blood cell count of the patients was 14.0 ± 5.0 × 109/L (range, 6.8-24.0 × 109/L). Patients were grouped by severity of injury based on the survival curves demonstrated by Champion, Sacco, and Copes: group 1, ISS of 8 or less; group 2, ISS of 9 through 15; and group 3, ISS of 16 or greater.21 The severely injured patients are a single group because mortality increases with ISSs greater than 16, and we wanted to determine if there was a difference between the mildly, moderately, and severely injured patients. To investigate changes in cell surface CXC receptor expression, we used flow cytometry analysis (Figure 1). There was a significant loss of CXCR-2 in the severely injured group compared with the mildly (P<.001) and the moderately (P = .05) injured groups. Loss of CXCR-1 was not statistically significantly different between the groups. To assess if functional loss was concordant with loss of receptor expression, migration to 10 nmol of IL-8, GRO-α, and fMLP was measured (Figure 2). With all stimulants, there appeared to be a trend toward loss of chemotaxis as injury severity increased. There were no differences between stimulants or between patient groups. Loss of chemotaxis was broadly effected. After determining that there was an appreciable decrease of receptor expression and function in the severely injured patients, we decided to determine if receptor–signaling effector coupling had been altered. We used calcium mobilization to study changes in receptor signaling ability. Stimulation of patient neutrophils with 10 nmol of IL-8 or fMLP showed no difference in their ability to mobilize calcium between the injury groups (Figure 3). Patients who had ISSs greater than 16 lost the ability to mobilize calcium to the CXCR-2–specific chemokine GRO-α. There were no differences in total calcium cellular content as demonstrated by lysis with 10% Triton X-100 after chemokine stimulation. Chemoattractant receptors on the surface of neutrophils serve not only to induce specific cell responses but also to modify inflammatory responses to other stimuli. As such, the regulation of these receptors is important for determining the character of the inflammatory response. Given the complex cytokine, complement, and lipid mediator fields these cells encounter, it is possible that dysregulation of neutrophil functions relates to cell exposure to 1 or more of these molecules. We have previously shown that CXCR-2 may play a role in the regulation of certain neutrophil functions, particularly IL-8 suppression of IL-8–induced chemotaxis by neutrophil-activating protein 2 and suppression of TNF-α–induced oxidative burst by GRO-α.18 Loss of this regulation may cause increased cell migration and production of destructive oxygen radicals. This may contribute to comorbid pathological characteristics, such as adult respiratory distress syndrome, systemic inflammatory response syndrome, or multiorgan system failure, observed in severely injured patients. In this study, we showed that cell surface expression of CXCR-1 and CXCR-2 is decreased following traumatic injury. Loss of CXCR-2 is greater than loss of CXCR-1, particularly in the severely injured group of patients. In the severely injured patient, neutrophils are likely exposed to cytokines for prolonged periods, which may in turn contribute to the increased loss of the receptor on the cell surface. These data are consistent with previous studies25,26 that showed that CXCR-2 is internalized more rapidly than CXCR-1 and that expression of CXCR-2 recovers more slowly than CXCR-1 after exposure to various cytokines. Like other G protein–coupled receptors, CXCR-2 is phosphorylated on C terminal serine residues. Phosphorylation targets the receptor for internalization and degradation, and renders it incapable of interacting with G proteins needed for signal transduction. Our data show a specific loss of a calcium flux response to GRO-α (a CXCR-2–specific ligand) in the moderately and severely injured patient groups. In contrast, calcium mobilization to IL-8 and fMLP is preserved in all patient groups. It would appear that not only is CXCR-2 removed from the surface but that the remaining CXCR-2 receptors are desensitized, possibly by phosphorylation, and are therefore unable to transduce a binding signal in contrast to CXCR-1 and fMLP receptors. This suggests that of the 3 receptors, only CXCR-2 is desensitized at the level of the receptor. While the relation of CXC receptor expression and function to trauma-induced inflammatory disease remains obscure, the study reported herein documents the selective loss of CXCR-2 expression and function in severely injured patients. Having previously documented CXCR-2–mediated suppression of oxidant production and inhibition of chemotaxis, we surmise that CXCR-2 may function as a regulator of the inflammatory response. Thus, specific loss of CXCR-2 expression and function may result in dysregulated cell function and thereby contribute to tissue injury at remote organ sites, leading to severe inflammatory syndromes and sepsis in patients who have suffered trauma. Inflammatory syndromes, such as adult respiratory distress syndrome, systemic inflammatory response syndrome, and multiorgan system failure, are causes of morbidity and mortality in patients with trauma and burns who have otherwise survivable injuries. An important step in the evolution of these inflammatory disorders is the recruitment of neutrophils into the interstitium and the subsequent generation of oxidants, resulting in extracellular matrix destruction and cytotoxicity. A family of proteins termed chemokines induces neutrophil recruitment. CXC chemokines may also be involved in the regulation of the respiratory burst. Based on in vitro studies, we hypothesized that the exuberant inflammatory response could be due to a loss of the CXCR-2 receptor in patients who had undergone trauma and who had various ISSs. The study reveals that indeed there is a loss of CXCR-2 in peripheral neutrophils of severely injured patients, and the regulation of this receptor is proximal to calcium mobilization. We also found a loss of chemotaxis to all stimuli with a minimal concomitant loss of receptor on the cell surface, suggesting receptor desensitization. This loss of CXCR-2 may explain the up-regulation of the neutrophils' respiratory burst, which may lead to end organ damage such as seen in the aforementioned inflammatory syndromes. A more refined understanding of the mechanisms for these events will provide insight into potential therapeutic strategies. This study was supported by grant T12GM08478-04 from the National Institutes of Health, Bethesda, Md; and grant 8600 from Shriner's Hospitals for Children, Cincinnati, Ohio. Presented at the 19th Annual Meeting of the Surgical Infection Society, Seattle, Wash, April 30, 1999. Reprints: Gina A. Quaid, MD, Department of Surgery, University of Cincinnati, Mail Location 558, Cincinnati, OH 45267-0558 (e-mail: chickgq@aol.com). Carol L. Miller Graziano, MD, Worcester, Mass: What has been really shown is that looking at a fairly novel chemokine and an important marker of potential PMN [polymorphonuclear leukocyte] alterations, the levels of the CXC chemotactic receptors on PMNs correlate to PMN numbers as well as to PMN functions. They have shown that there is a decrease in the detectable levels of CXCR-2 on the PMNs and that this is correlated with an increasing severity of injury. One of the questions that I think is raised by these data is that since there are differences between IL [interleukin] 8 and GRO [growth-related oncogene], and 1 of those differences is that IL-8 has a very much higher affinity for binding to receptor, some of these data may be explained by the fact that IL-8 can compete off any ligand that is already bound onto the surface of the PMN, whereas GRO cannot, and consequently if you have ligand bound onto, that is, a chemokine, bound onto the receptor, the CXC receptor, you might not be able to see that being competed off with GRO, and so this would explain some of the data. And I think this is particularly important, because there is actually a chemotactic defect to all the receptors, that is, IL-8, fMetPhe [formylmethionine-phenylalanine], and GRO all show a decrease in chemotactic stimulatory ability in the severely injured group. So that those differences cannot be explained just on the basis of the CXCR-2 binding. So one of the things I would like to ask is, have you looked at the internalization of this receptor, and that is, have you looked in a permeablized cell for internalization of the receptor? And the second thing is, have you looked molecularly or morphologically for differences in the actin mobilization? That might explain the chemokine differences as well as the chemotactic differences. Dr Quaid: To address your first question, we are in the process of developing techniques to examine the internalization of events of the CXC receptors, specifically Western blot analysis and confocal microscopy. Localization of the receptor has not been done in patients to date. We have not addressed the molecular or morphological changes to actin in association with these receptors. Daniel T. Traber, MD, Galveston, Tex: In looking at peripheral circulating polymorphonuclear cells, you are just looking at the tip of an iceberg, and I would predict that in the trauma patients you would have IL-8 released, and the cells that had the most sensitive of the receptors would be moving out to lodge in the tissues where the IL-8 was released, and those would be replaced by more immature types of cells. Have you looked at the number of receptors on these cells with regard to their age? New band cells, for instance, do they have a lower number of these receptors than an older polymorphonuclear cell? Dr Quaid: We have not addressed that question to date, but it is a very good question. I think it is something we will consider in the future. John A. Mannick, MD, Boston, Mass: About 13 or 14 years ago, I have forgotten which, our group, in association with Drs Moore and Fedron, published some work on human neutrophils in a series of patients with major burns and looked at neutrophil chemotactic function at varying intervals after injury; and we found that while chemotaxis to C5a was lost characteristically for long periods of times in these cells, they retained their chemotaxis to fMLP. Now, I realize that you excluded burns, and I am wondering why you did that, and, secondly, I wonder if you have any explanation why these trauma patients should have been so significantly different from our group of burn patients? Dr Quaid: We excluded burns initially because of the dramatic changes this type of injury has on the body and neutrophils themselves. We are in the process of looking at burn injury now. We believe that trauma, burns, and sepsis may have different impacts on neutrophils and ignite different components of the inflammatory pathway. I think that addresses both of your questions. Carl Hauser, MD, Newark, NJ: I think that this is very important work, especially because the CXC chemokines are probably some of the major effectors of paracrine cross talk between endothelial cells and neutrophils as they pass through the lung and either do or do not get trapped. Our results, looking at similar systems, have been somewhat different than yours, but I think that they can be integrated successfully. If you look at lower doses of chemokines and higher doses of chemokines, the effect on receptor regulations are entirely different. In our experience at low dose, GRO stimulation does not down-regulate the CXCR-2. IL-8, at quite low doses, does down-regulate the CXCR-2, and very completely. Further, when you ligate the CXCR-2, subsequent absolute calcium mobilization is increased at CXCR-1 in response to physiologic concentrations of the IL-8 chemokine. Have you looked at the absolute calcium concentrations? I know you showed us some 340/380 traces, but have you quantitated CXCR-1 calcium mobilization? We have found that calcium mobilization is actually increased to IL-8 in these patients. Also, the amount of receptor down-regulation that your samples show for CXCR-2 is not nearly as complete as the down-regulation that is incurred with typical high-dose chemokine stimulation, say, 100 nmol of IL-8, or even 10 nmol. These doses will down-regulate CXCR-2 85% to 90% within a minute or 2. You are only showing, oh, 15%, 20%, 25% down-regulation over the course of time, admittedly increasing as the patient's severity is greater. So I would like your comments on that. And I suppose lastly, my impression is that down-regulation of the CXCR-2 is probably not a marker for neutrophil disability but rather for prior neutrophil activation, and I would like your thoughts on that. Dr Quaid: In regard to absolute calcium concentrations, we elected to measure calcium mobilization by the ratio. We indeed have the capability of measuring concentrations, and our future experiments are being done in this manner. Second question regarding CXCR-2 down-regulation, we feel that the changes that are seen are due to continued exposure to cytokines after 24 hours. The reason there is not as much down-regulation as seen with earlier time points reported for in vitro studies may be because at this time point, recycling or de novo synthesis of the receptor may be occurring. The third question is CXCR-2 may be an indirect activator of the cell. Realistically, this receptor is an inhibitor of the inflammatory response and by deactivating the receptor, there is an indirect activation.